One thing we take seriously here in the Walden University Writing Center is our students' commitment to positive social change. The programs of study they enter, the original research they produce, and their professional commitments all speak to the importance of Walden University's mission in their lives and work. These students use their skills, expertise, and determination to do amazing things for people all over the world. Writing is central to this project. There are a variety forms and genres, not always scholarly, that can help these agents of change. So to support these scholar-practitioners in their journeys, our staff of professional writing instructors creates resources that are aimed specifically at supporting Walden students' social change goals. Below are three of our most popular social change resources: Live Webinar recordings of sessions that approach writing for social change in different ways. Exploring Perspectives: In this webinar, you'll join a discussion about writing and social change. You'll have the change to discuss your own goals for social change and learn how writing can help you achieve those goals. Specific attention will be paid to how writing can help you generate ideas, as well as how you can use writing in areas like social media, grants, newspapers, and blogs to communicate your vision for social change. Using Restorative Writing to Enact Social Change: Maintaining personal wellness is key to achieving your goals. Additionally, writing can be a useful tool for processing difficult events and discovering connections between your experiences and local, community, or global problems. In this webinar, you will explore how you can use restorative writing to promote wellness for yourself and your community. Information about the concept of restorative writing and how it evolved in academia will serve as the foundation for our discussion before you practice restorative writing during this webinar. Finally, you will reflect on how restorative writing can help you enact social change. Grant Proposals: Sometimes achieving social change requires support from others. This webinar will give you tips for communicating your goals for social change through grant proposals, introducing you to this genre of writing. While we will not provide tips for finding grants, you will be able to use this webinar to help you communicate your social change vision to others in the grant format. The Walden University Writing Center produces webinars that teach APA guidelines and writing skills for all Walden students, along with webinars specifically for undergraduate, graduate, and doctoral capstone students. Webinars offer live writing instruction, as well as an opportunity for students to connect via Q&A and chatting with staff and other Walden students, and each webinar is recorded for later viewing. 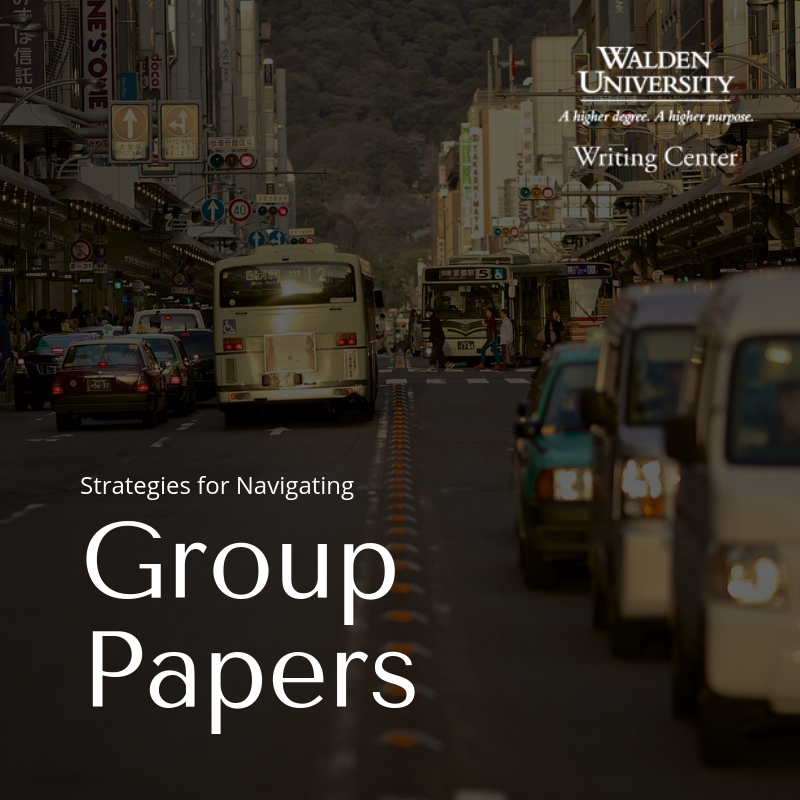 If you’re familiar with the Walden University Writing Center and our recommendations, you’ve probably heard about the MEAL plan for paragraph development. The MEAL plan is a wonderful tool to help keep your paragraphs focused and ensure that you’re supporting your evidence with analysis. However, there are times when the MEAL structure doesn’t work as effectively, and I want to go over a few of those in my blog post today. Introductions to your work generally won’t follow the MEAL plan. This is because in an introduction you begin more generally and get specific, culminating in your thesis statement. Unlike a MEAL plan paragraph, which is connected back to your thesis through the topic sentence and lead out, your introduction is doing a bit of a different job in preparing your reader for the context of your paper and ending with a focus on your argument. Like an introduction, a conclusion paragraph is doing slightly different work than a standard MEAL plan paragraph in your paper. A conclusion sums up the important details and points from your paper, and generally doesn’t include evidence and analysis—it’s all pretty much analysis and summary at that point! The MEAL plan structure doesn’t work well with conclusions for this reason. If your assignment is to write a document that is not a typical course paper (like a letter to a government official, interview transcript, statistical report, etc.) then the MEAL plan is typically not very effective, simply because the forms of these documents are unique—just like academic papers are unique in using the MEAL plan! You definitely can keep the MEAL plan in mind as you write, but the purposes of these documents or sections of a paper are different, they likely won’t have a thesis, and some may not even require outside evidence. The MEAL plan structure generally won’t apply in these circumstances. Like the examples listed above, parts of your premise/prospectus may not use the MEAL plan because they have a specific structure and content already in place. Be sure to follow premise or prospectus guidance documents and look at examples of these documents to ensure you are meeting expectations—and when in doubt ask your chair! The MEAL plan will likely be helpful in some parts of your premise/prospectus, but others are very specific regarding length and focus, so default to the guidance documents or faculty expertise in these cases. When should you use the MEAL plan? In body paragraphs in your academic assignments for Walden coursework! 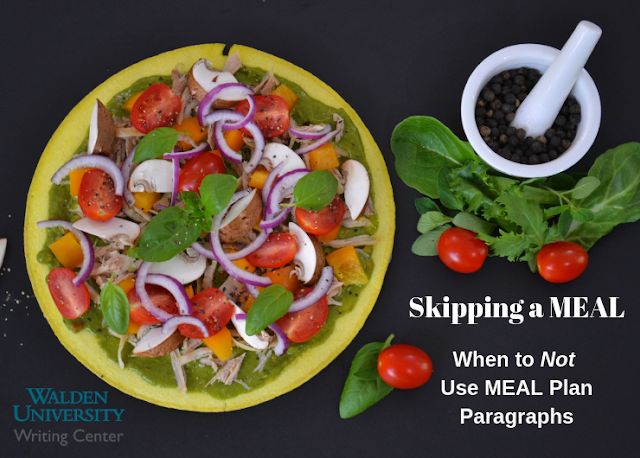 A typical discussion post or course paper should use the MEAL plan in the body paragraphs (after your introduction and conclusion). However, keep these exceptions in mind and use your judgement and faculty as resources to help you effectively use the MEAL plan as well as shift to other formatting and approaches where relevant and necessary. Claire Helakoski is a writing instructor at the Walden Writing Center. Claire also co-hosts WriteCast, the Writing Center's podcast. 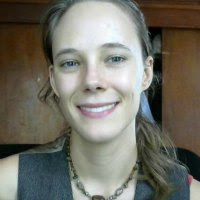 Through these multi-modal avenues, Claire delivers innovative and inspiring writing instruction to Walden students around the world. Listen to episode 8 of WriteCast, titled "Top 10 Tips for Group Papers and Collaborative Writing"
The Walden University Writing Center supports Walden University in its goal of providing a diverse community of career professionals with the opportunity to transform themselves as scholar-practitioners so that they can effect positive social change. This week here on the Walden University Writing Center Blog, we'd like to share with you our most-recent podcast episode of WriteCast: A Casual Conversation for Serious Writers. This month's episode introduces our listeners to the idea of restorative writing: a practice where people who have experienced trauma use writing to begin to heal. Writing Instructors Ellen and Miranda join Kacy and Claire for this month's special episode to describe more about what restorative writing is, how to practice restorative writing, and how to use it as a vehicle to understand and process individual and/or community trauma. Ultimately, restorative writing can help writers discover ways to heal and overcome those challenges through social change. Episode 61 also features an "episode bonus" which we are very excited to share with you. This bonus contains a follow-along activity from episode 61. Click the player below to access only the guided writing opportunity from the episode. As always, you can access our entire library of WriteCast episodes, along with full transcripts, by visiting our podcast resources page on our website. Recorded Writing Center webinar: "Using Restorative Writing to Enact Social Change"
DeSalvo, L. A. (2000). Writing as a way of healing: How telling our stories transforms our lives. Boston, MA: Beacon Press. WriteCast: A Casual Conversation for Serious Writers is a monthly podcast written, produced, and published by staff in the Walden University Writing Center. Join us each month for a dialogue between two experienced writing instructors. Possible episode topics will always be considered from listeners--share your questions and suggestions in the comments. In this episode of the WriteCast podcast, Claire and Kacy sit down with Melissa Meghan, two Walden Writing Center instructors, to talk about how they work toward positive social change in their communities by writing to their local representatives. Claire and Kacy ask Melissa Meghan to share how this type of writing is similar and different to academic writing, the tools they use when writing for social change, and their experiences with the process. As a student working to create positive social change, we hope that this podcast episode helps you think about the ways in which your academic writing can develop into other forms of writing. To subscribe to WriteCast: A Casual Conversation for Serious Writers, click the icons in the player below or click "subscribe" for sharing options. Visit our show page for a list of all of our WriteCast episodes and written transcripts for each episode.